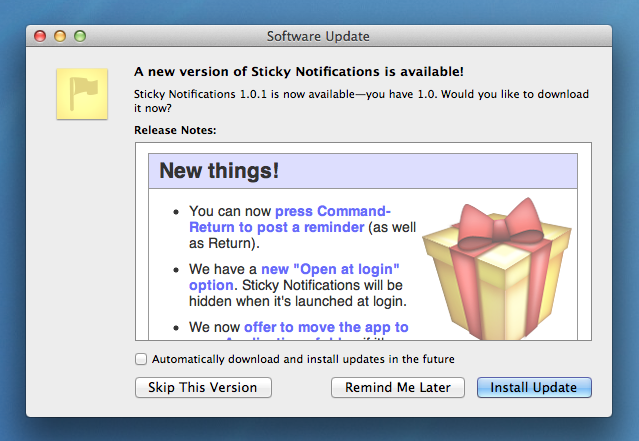 I’ve released version 1.0.1 of my recently-launched Mac app, Sticky Notifications. I wrote about the app extensively last week, and also published an article on the challenges of releasing it outside of the Mac App Store, which you may find interesting. Today, exactly a week after version 1.0, the 1.0.1 update is available. If you’re already using the app, you should check for updates using the action (cog) menu in the main window, or via the Preferences. If you don’t have the app already, you can download it here. 1.0.1 has numerous additions and fixes, including several feature requests I’ve had over the past few days. You can read the full list of changes here. I decided to have a little fun with the release notes (as shown by the in-app update window, provided by Sparkle), by adding appropriate emoji icons to each category: new, changed, and fixed. You can see them all via the full release notes link mentioned above. I have a few new features in mind for a version 1.1 release, which I’ll begin working on soon. If you want to get in touch (except for support; please use email for that, by choosing “Send Feedback” from within Sticky Notifications), I’m @mattgemmell on Twitter, and also on app.net.